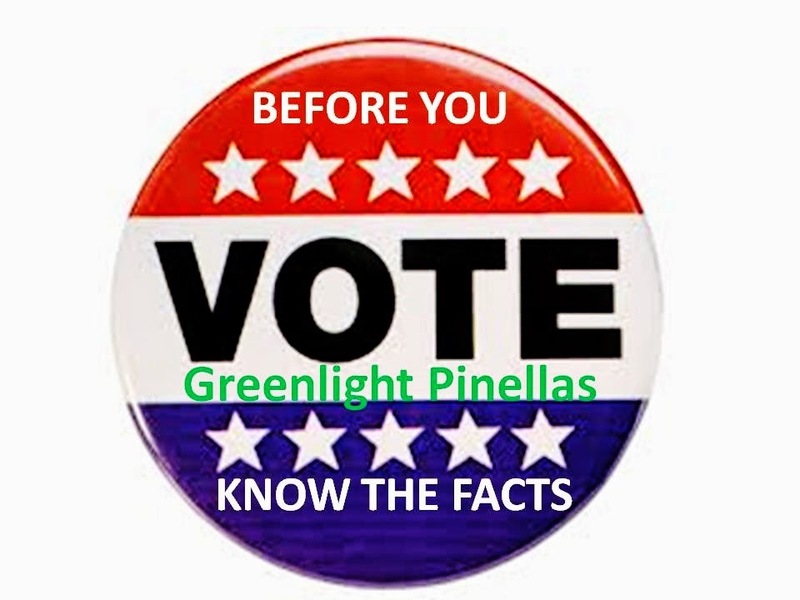 You are not directly voting on the GreenLight Plan. You are voting to make Ordinance 13- 34 a law. This is an important distinction, because Ordinance 13- 34 will become a law if the referendum succeeds, but the GreenLight Plan does not. Section 4. Distribution, Use and Financial Management of Surtax Proceeds. (a) The Surtax shall be collected by the Department of Revenue and distributed monthly to the County. The County shall deposit the proceeds into the Transportation System Surtax Trust Fund, which fund is hereby created, to be held by the Pinellas County Clerk of the Circuit Court and Comptroller ("Clerk") solely for the benefit and distribution in accordance with the terms of this Ordinance and any inter local agreements providing for the distribution of Surtax proceeds. Note that there are NO terms of revenue distribution in the Ordinance and there is no definition of the terms of the undefined interlocal agreements. The funds may be held by the County but should they be pledged as bond payments, the bond covenants will set the terms for distribution. including an expanded bus system with bus rapid transit, increased frequency and extended hours, and local passenger rail and regional connections, and for the payment of the principal and interest on indebtedness (including refinancing thereof) or other financial obligations which may be incurred for such transportation improvements, as authorized by the Acts. The County is authorized to enter into interlocal agreements pursuant to the Acts providing for the distribution of the proceeds from the Surtax to be expended for the purposes authorized in this Ordinance. In this Sub Section we get close to a commitment to expanding bus service, with some detail: "expanded bus system with bus rapid transit, increased frequency and extended hours", but no specifics related to the amount of funds, distribution or obligation of funds to the bus expansion or timing. Here PSTA begins laying the ground work for converting the sales tax into a bond issue and sets the stage for an undefined interlocal agreement providing for the distribution of the sales tax proceeds. No detail as to what those agreements will cover, how they will be developed or who will actually vote on or approve them. The County and PSTA are now trying to define these interlocal agreements before the Referendum somewhat like the cart before the horse. Interlocal agreements with the other jurisdictions in the County remain undefined. Note the Ordinance (Law) that you are being asked to approve provides not only for the payment of bond indebtedness, but also allows the pledging of the sales tax revenue for refinancing the bonds, thereby virtually assuring that this sales tax will never go away.